The wolf will live with the lamb,Â the leopard will lie down with the goat,Â the calf and the lion and the yearling together;Â and a little child will lead them. Where all different types of animals that would normally not live peacefully among each other are lying next to each other. It is by the grace of God, without any sin in His kingdom that these animals can lie beside each other and not harm one another or be afraid of each other. Sin has been conquered, the victory won, and death is no more in His future Kingdom. I chose to draw using a traditional drawing method because I know that it is so much easier to fix and manipulate aesthetics in a digital drawing environment. However, with traditional drawing, your hand is not encumbered by the computer trying to figure out what you are drawing. Yes, there are ways in which you can be spontaneous in digital drawing, but I feel that this is even more the case with traditional drawing. Sometimes ‘accidents’ that come out of spontaneous drawing can be good accidents that I think is even better than what I had planned out before. I used to see art as a form of worship to God before I was a believer, and it is more so the case now that I have come to Christ. This piece is no different. Before I start a piece, I give it up to God, knowing that He has the outcome already determined, all I have to do is plan and paint. Sometimes, I do not even have to plan certain strokes, and I find myself able to rest at ease instead of worrying about how bad the painting might end up. Also, I know that even if I do mess up, God’s grace allows me to paint over it or even start over. That’s what happened a lot with this painting. 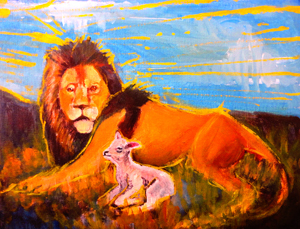 I originally had a different interpretation for this piece, but eventually, I came back to the Lion and the Lamb; and while it may seem a overused subject to the average viewer, I believe that it captures our hope in Christ. So I hope that this painting brings glory to Him and allows you to see even a small glimpse of that same glory. Christine graduated from UCLA with a BA in Art History. She loves art and wants to glorify God with the gifts that He’s given her. She is currently pursuing further education at an art school and hopes to build a career in either illustration or animation. Currently, her time is spent in Northern California, where she is building her art portfolio and developing her skills in animation. Head over toÂ RE:NEW Magazine Issue 1Â to read this story in its original format. Christine Hwang graduated from UCLA with a BA in Art History. She loves art and wants to glorify God with the gifts that He’s given her. She is currently pursuing further education at a community college and hopes to build a career in either illustration or animation. Currently, her time is spent in Northern California, where she is building her art portfolio and developing her skills in animation.